2018 was a good year and 2019 seems to be heading further in the same direction. It was a strange year, but I can’t complain about it all! 2018 was filled with things that included new beginnings, promotions, gifts that were priceless, frienemies, a 3rd childhood, people that wanted to be me, trips, shots being fired, additions to my family, wake up calls, acknowledgments, and much-needed focus. Each and every one of these circumstances has inspired me in some kind of way that has me looking at 2019 with optimism, pessimism, love, less than love, stability, and determination. I loved 2018, but I am glad that it is gone so that there is room for 2019. 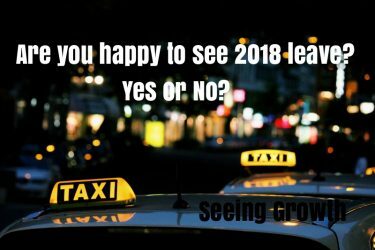 Are you happy to see 2018 leave? This tee shirt shows awareness to the situations, things and surroundings that we face. Available in black or white. Additional costs for long sleeves and larger sizes. Emmanuel Brown is a father, the founder of Seeing Growth and Editorial Director of Label Me Royalty. He promotes the idea of Seeing Growth in all aspects of life through the use of positive self-confidence. Seeing Growth is a community forum that promotes self and community growth through the collaboration of talents, thoughts, ideas, and actions. We look for meaningful, relevant and relatable content to share with the world.